The Pier Arts Centre Reference Library contains a unique collection of art books and catalogues, many donated to the gallery as part of Margaret Gardiner’s original gift. A number of generous and notable bequests have made significant additions to the range of titles available. 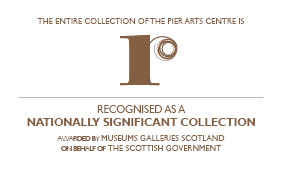 The library also benefits from book and catalogue exchanges with National Galleries of Scotland and Tate as well as receiving catalogues and publications of national and international exhibitions that include loans of works from the Pier Arts Centre collection. Use of the Pier Arts Centre reference library is encouraged for self-directed study by students and the wider community at all levels of study. The Reference Library is located on the 2nd floor of the gallery.